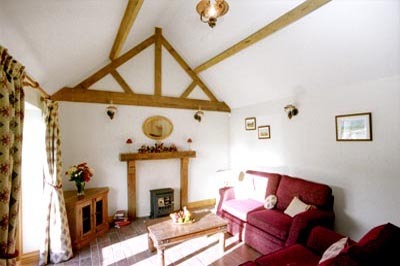 Yews Barn is a luxury detached self-catering holiday barn accommodating 2 people. It is centrally placed in Shropshire, just off the A49/A5, making it an ideal touring base for this picturesque county. Yews Barn, originally built in 1840, has been tastefully restored and converted into a holiday barn in 2002 (by a R.I.C.S award winning contractor) fully equipped with all modern facilities, yet retaining many of its original features, including exposed beams, courtyard and unusual sloping roof. It is situated on its own in a quiet idyllic rural setting on Lyth Hill, near the former home of famous Shropshire authoress & poet, Mary Webb. It is a stones throw away from the Lyth Hill Country Park with its ancient woodlands & breathtaking views of the nearby South Shropshire Hills. This quiet, picturesque location together with the barn’s exposed beams, 4 poster bed, spa bath, private courtyard & views of deer grazing in the meadows nearby make it an ideal romantic retreat. Fresh flowers & a bottle of wine will be waiting for you on your arrival.